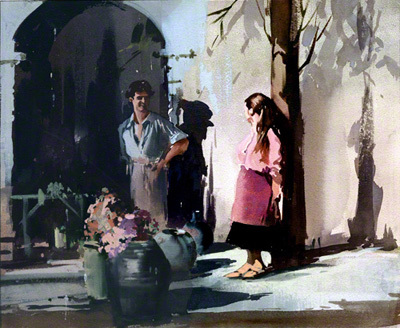 A water colour painting showing an encounter between a man and a women by Claude Buckle. This painting is also called Spanish Man. The location is probably a restaurant with the female table server and a Spanish worker meeting for the first time. Body language definitely suggests a flirt is taking place. Created in 1967.